There were two new teams in the poll with No. 24 Marquette and No. 25 Buffalo. 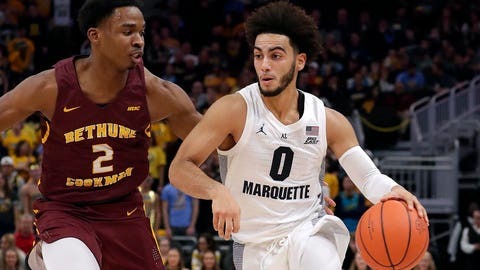 It’s the first appearance for Marquette in nearly five years since last appearing at No. 25 in November 2013. The Golden Eagles began their season by beating UMBC 67-42 and Bethune-Cookman 92-59. As for Buffalo, it’s the first AP Top 25 appearance in program history. It comes after the Bulls got 43 points and 14 rebounds from CJ Massinburg to beat then-No. 13 West Virginia on the road — another marquee upset for a team that beat Arizona and eventual No. 1 overall NBA draft pick Deandre Ayton in the first round of last year’s NCAA Tournament.